While the older generation looks fondly on the trusted iron and the super fast race car, kids have broader tastes and imagination. The desire to collect B&O Railroad or to build a hotel on Boardwalk doesn't capture the entrepreneurial spirit of today's little moguls. The new Monopoly Empire Game brings today's hottest brands to the world of Monopoly. The basic elements that everyone has come to love are still part of Monopoly Empire, but these elements have been updated. First, players choose a token. These golden tokens represent pop culture icons like the X-Box game controller and McDonalds french fries. After choosing a token, the play continues similar to classic Monopoly rules. Passing GO, heading to Jail and cards of chance are all back. A Players can purchase brands as they travel along the board. The goal is to stack your tower with brands. Also, players can collect rent for brands that they own. The biggest difference is that players cannot go bankrupt. If a player cannot pay, they must hand over their top brand in their tower. To win, the player must stack his tower of brands first. 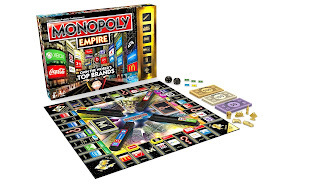 The kids enjoy this version of Monopoly Empire because it has brands that they know. They really like the gold game pieces and the fun of becoming uber rich. If your family is looking for an additional Monopoly version to your game library, the Empire option is a good choice for tweens and teens. 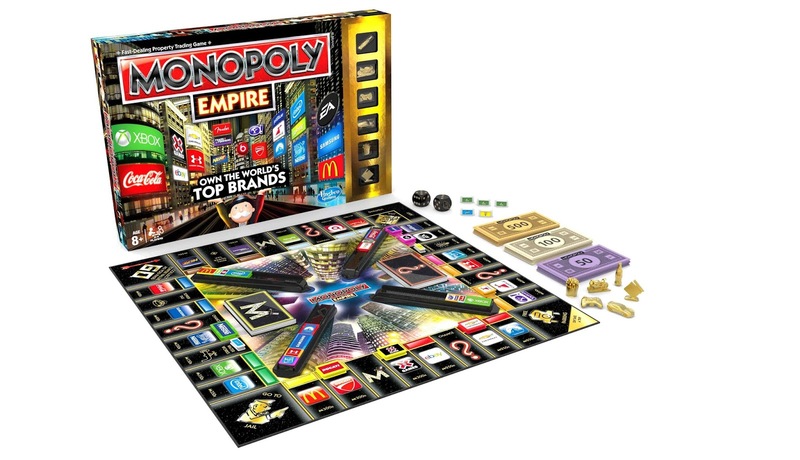 Monopoly Empire retails for approximately $19.99. It is available on-line and at many mass merchants or toy stores. Would you like to play Monopoly Empire? I have a copy to give one of my readers. Please use the Rafflecopter to enter. Who doesn't love Monopoly? I loved it as a kid and this looks like it would be a great weekend game with friends! I'd like to win McDonalds! If WalMart is on the list I would want to own them. Second would be McDonalds. I like the Disney, Star Wars, and Hotel editions. I would love to own Ebay! Coca Cola. This game is really cool. I would love to play Monopoly Empire! I would want the Empire version. I would want the Intel company! I would like to have Fender! I would like McDonalds. Thanks so much for the fantastic giveaway! I think I'd go with McDonald's! I think I'd vote for McDonalds. I would love to own Coca Cola! I would like to own Walmart. I would love to own McDonalds. I want to own the Google. I would love to own Apple! I would love to have the junior disney addition. I would pick Disney! How cool? This looks like a fun new game. I would love to play Monopoly Empire! I would bring it with me when we go camping! We love to play board games while camping!. Love Monopoly! I installed the org. one on my new phone & often even choose to play Monopoly slots(I only go every couple of months. I would love to own Apple. I would like to own samsung. i would like to own apple or hasbro!